The protein labeling market is expected to reach USD 1,894.5 Million by 2020 from USD 1,089.5 Million in 2015, at a CAGR of 11.7%. Protein labeling is carried out using labeling reagents and kits to label an antibody or other protein, to make a fluorescent probe, enzyme conjugate, biotinylated binding reagent, or iodine-labeled tracer for detecting proteins in tissues, cells, and biochemical assays. The major drivers for the protein labeling market include the increasing healthcare expenditure, rising R&D spending, and increasing proteomics research. 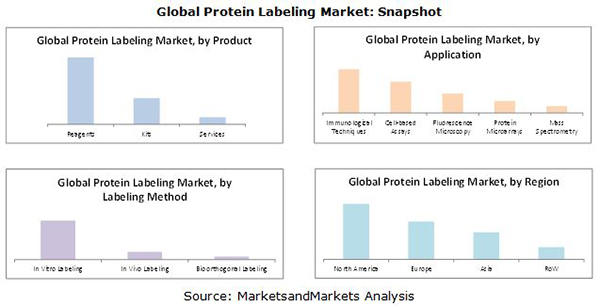 In this report, the protein labelling market is segmented on the basis of products, applications, labeling methods, and regions. On the basis of products, the protein labeling market includes reagents, kits, and services. Based on application, the protein labelling market is segmented into cell-based assays, fluorescence microscopy, immunological techniques, mass spectrometry, and protein microarray; while, on the basis of labeling methods, the protein labeling market is categorized into in vitro labeling, in vivo labeling, and bioorthogonal labeling. Geographically, the protein labeling market is segmented into North America, Europe, Asia, and the Rest of the World (RoW). North America is further segmented into the U.S. and Canada. The major players in the global protein labeling market are Thermo Fisher Scientific, Inc. (U.S.), Merck KGaA (Germany), PerkinElmer, Inc. (U.S.), General Electric Company (U.S.), F. Hoffmann-La Roche AG (Switzerland), New England Biolabs (U.S.), Kaneka Corporation (Japan), Promega Corporation (U.S.), LI-COR, Inc. (U.S.), and SeraCare Life Sciences, Inc. (U.S.). The protein labeling market is expected to reach USD 1,894.5 Million by 2020 from USD 1,089.5 Million in 2015, growing at a CAGR of 11.7% from 2015 to 2020. A strong trend of increasing healthcare expenditure will majorly drive the growth of the market. Other growth factors include increasing R&D spending and growth in proteomics research. The increasing use of protein labeling in in vitro labeling, in vivo labeling, and bioorthogonal labeling methods will provide opportunities for market growth. This report segments the protein labeling market by product, application, and labeling method. On the basis of products, the global market is segmented into reagents, kits, and services. In 2015, the reagents segment is expected to account for the largest share of the global protein labeling market. The application segments of protein labeling market are cell-based assays, fluorescence microscopy, immunological techniques, mass spectrometry, and protein microarray. In 2015, the immunological techniques segment is expected to account for the largest share of the global protein labeling market. On the basis of labeling methods, the protein labeling market is segmented into in vitro labeling, in vivo labeling, and bioorthogonal labeling. In 2015, the in vitro labeling methods segment is expected to account for the largest share of the global protein labeling market. The geographic segments included in this report are North America, Europe, Asia, and the Rest of the World (RoW). North America is further subsegmented into the U.S. and Canada. In 2015, North America is expected to command the largest share of the global protein labeling market. However, Asia is expected to register the highest growth rate due to the increasing healthcare expenditure and rising R&D spending in this region. 11.11 Seracare Life Sciences, Inc. Figure 65 Company Snapshot: Thermo Fisher Scientific, Inc. Figure 66 Company Snapshot: Merck KGaA (Germany). Figure 67 Company Snapshot: Perkinelmer, Inc.